Excessive earwax may impede the passage of sound in the ear canal, causing conductive hearing loss. Hearing aids may be associated with increased earwax impaction. It is also estimated to be the cause of 60–80% of hearing aid faults. Earwax can get into vents and receivers, of the hearing aid.The acidity of the earwax degrades the components inside the hearing aid. Excessive earwax can also cause tinnitus or ringing in the ears. ^ a b Okuda I, Bingham B, Stoney P, Hawke M (Jun 1991). "The organic composition of earwax". J Otolaryngol. 20 (3): 212–215. PMID 1870171. ^ "The science of stinky sweat and earwax". 2015-04-14. ^ "Miscellaneous musings on the Ainu, I". Ahnenkult.com. Retrieved 2014-04-28. ^ Francie Diep (2014-02-13). "The Scent Of Your Earwax May Yield Valuable Information | Popular Science". Popsci.com. Retrieved 2014-04-28. ^ Aleccia, JoNel (August 29, 2018). "The Dangers of Excessive Earwax". ^ a b "Ear wax". Tchain.com. Retrieved 2010-05-02. ^ "Ear Candling: Getting Burned | PeopleHearingBetter". phb.secondsensehearing.com. Retrieved 2019-04-16. ^ "Iberian manuscripts (pigments)". Web.ceu.hu. Retrieved 2014-04-28. ^ "Pliny the Elder, The Natural History, BOOK XXVIII. REMEDIES DERIVED FROM LIVING CREATURES., CHAP. 8.—REMEDIES DERIVED FROM THE WAX OF THE HUMAN EAR". www.perseus.tufts.edu. Retrieved 2019-04-08. ^ Child, Lydia Maria Francis (1841). The American frugal housewife ... - Google Books. 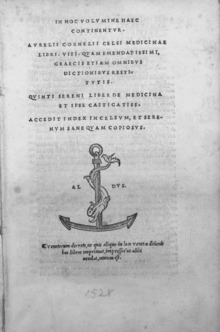 p. 116. Retrieved 2010-05-02. ^ Craig S. Nelson. "What can you tell us about whale ear wax?". Cs.ucf.edu. Archived from the original on 2011-06-29. Retrieved 2010-06-20. ^ Osborne D (2013-09-17). "Ear Wax Reveals Whale's Tale". Australian Broadcasting Corporation. This page was last edited on 16 April 2019, at 04:24 (UTC).